The collection of local Amish folk art which has been displayed in the Hershberger Art Gallery for the past several months is moving to the Good Library Gallery, where it will remain until Nov. 18. “The items on display come from a collection purchased for the college by alumni who support the Mennonite Historical Library and the Mennonite-Amish Museum Committee,” said Ervin Beck, a former GC professor, who has worked with the museum to display Mennonite and Amish art since 1985. Beck explained that all of the items are antiques, but that some even date as far back as 1871. 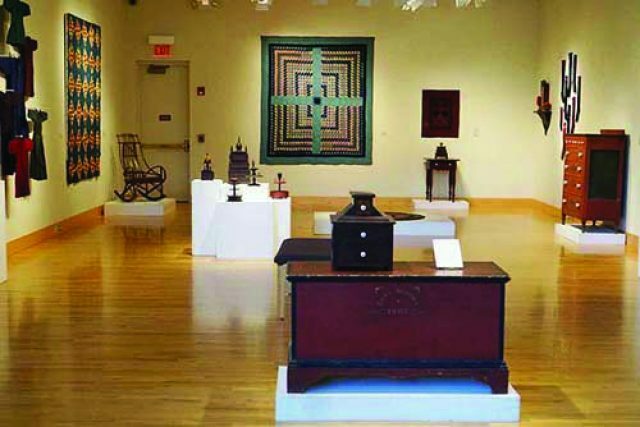 The pieces are categorized as “folk arts,” which means that they were produced in a culturally isolated context (in this case, within the Old Order Amish community) by people untrained as artists. “[Though the] Fine Art World and the Folk Art World regard [the pieces] as ‘art,’… the Amish would not use that term for useful, homemade objects [such as these],” said Beck. As such, a few of the artists are named in the exhibit, but many are not. All the items are handmade and were collected by David Pottinger of Goshen. Bertha agreed to help Pottinger begin to gather quilts that would eventually become part of “The Pottinger Collection,” which also includes other Amish folk arts. As he collected, Pottinger recorded “any and all” information he could glean about each quilt, a task made easier by the Amish practice of putting dates and initials in the quilting. “Assembling the quilt collection was certainly exciting and fun, but the experience of becoming friends with the Amish was more deeply rewarding and satisfying than acquiring the quilts themselves,” said Pottinger. A number of these quilts are displayed in the exhibit. Other pieces of various kinds are now housed in permanent museum collections in New York City, Indianapolis, Fort Wayne and Springfield, Illinois. The exhibit is curated by Pottinger and his wife Faye Peterson, and is sponsored by the Goshen College Art Department and the Mennonite-Amish Museum Committee.